Toronto ? Carlos Delgado sure woke up in a big way. Delgado connected in all four of his at-bats, leading the Blue Jays over Tampa Bay, 10-8. His first homer of the game was the 300th of his career. Delgado was the first player to homer four times in a game since former Toronto teammate Shawn Green did it for Los Angeles May 23, 2002, against Milwaukee. Delgado was the fifth AL player to homer four times, the first since Mike Cameron for Seattle May 2, 2002, against the Chicago White Sox. Lou Gehrig, Rocky Colavito and Pat Seerey also did it in the AL. Delgado’s record-tying shot came leading off the eighth inning, a long drive to center field that tied it at 8. 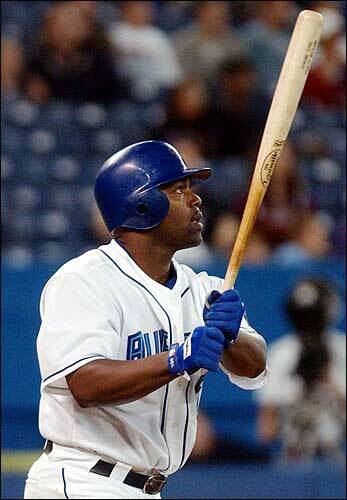 Toronto's Carlos Delgado hits the first of his four home runs against Tampa Bay. Delgado became the 15th player in major-league history to hit four home runs in a game, and the Blue Jays beat the Devil Rays, 10-8, Thursday night in Toronto. Delgado flipped his bat and his teammates threw up their arms when he connected on a 2-2 pitch from Lance Carter to match the mark. Once Delgado returned to the dugout, he took off his helmet and acknowledged the cheers from the crowd of 13,408 at SkyDome. Delgado said he wasn’t feeling good before the game. He said he had a cold and took antibiotics. The All-Star first baseman was the sixth player to homer in four straight at-bats in one game. Cameron also did it. Delgado became the 98th player to reach 300 career homers with a three-run shot off Jorge Sosa in the first inning. The ball hit off Windows restaurant and bounced back into center field. Delgado asked for the ball as he rounded the bases. Delgado’s solo drive in the fourth gave Toronto a 4-1 lead, and he added another solo homer in the sixth off Joe Kennedy that tied it at 6. Delgado finished his big night with homer No. 41. The six RBIs matched a career high and he now has 141 RBIs this season, setting a team record. Delgado got three of the balls, including the last one. He said he would give the record-tying souvenir to his mom. Toronto general J.P. Ricciardi said Delgado might have earned himself the AL MVP Award with this performance. “Tonight might be the thing that just catapults him in front of everybody else,” Ricciardi said. Overall, it marked the fifth time Delgado has hit at least three homers in a game and his 36th multihomer game. His last three-homer game came April 20, 2001, at Kansas City. Boston — The Red Sox are back in the playoffs for the first time since 1999. Derek Lowe held Baltimore to two hits over six innings, and Jason Varitek, Nomar Garciaparra and Kevin Millar homered as Boston clinched the last spot in the AL playoffs by beating the Orioles. The Red Sox, who have made the postseason 10 times since 1918 without winning a championship, are four games ahead of the Mariners in the AL wild-card race with three games remaining. Boston’s win finalized the AL matchups for the first round: Minnesota will play against the Yankees starting Tuesday in New York, and Boston will open the following day at Oakland. Playing before a full ballpark for the 64th consecutive home game, the Red Sox quickly gave the 34,526 in the crowd something to cheer about. It was 12-0 after four innings, and the Red Sox coasted. Manager Grady Little emptied his bench after five innings, and Lowe (17-7) left after six with the victory all but secure. The Red Sox won’t be back at Fenway Park until Game 3 of the playoffs, on Oct. 4. Lowe did not allow a hit through 4 1/3 innings. He wound up yielding one earned run and four walks while striking out one. Bill Mueller went 3-for-5 to raise his league-leading batting average to .327, adding two runs and three RBIs for Boston. Detroit — Shane Halter hit a two-out, solo home run in the 11th inning and Detroit snapped Minnesota’s 11-game winning streak. With their third straight win, the Tigers would have to lose their final three games of the season to break the post-1900 record of 120 defeats by the 1962 New York Mets. Detroit (41-118) set the AL record for losses Monday night with its 10th consecutive setback. Since then, the Tigers have not lost. Detroit has won three straight.